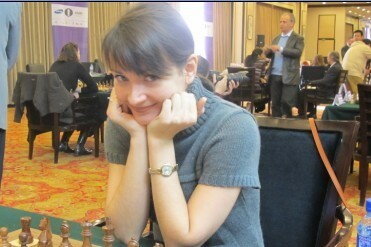 This round, the sole leader Alexandra Kostenuik of Russia slowed down her steps and played a relatively quick draw against Anna Muzychuk to keep her lead. The 2 players who were trailing behind the leader Kosteniuk by 1 point before this round were Nana Dzagnidze and Ju Wenjun and they played each other in this round,ended in draw . Other decisive results this round included a win by Kateryna Lahno over World Women's champion Hou Yifan from China in a complicated game whilst lower down the field Yelena Dembo scraped a win over Almira Skripchenko and Viktorija Cmilyte defeated Elina Danielian.